K-12 schools have the same staff scheduling challenges as any business. In fact, an average elementary school has more employees than 90% of U.S. businesses—which have less than twenty. Schools have multiple departments, each with unique scheduling logistics. School workforces are more diversified than most businesses. Employee scheduling at schools may be even more complex. Schools have been behind the curve when it comes to innovative staff scheduling tools. Systems with education-specific tools solve staff scheduling problems. Let’s look at the challenges of school staff scheduling. Schools that implement scheduling software need to make sure the system has dedicated education tools. Basic systems with limited features won’t solve your scheduling problems. They can actually make it more difficult. It takes a village…to run a school. You have the teachers, of course. The teachers have aides. There are student teachers. Some classes have two teachers who job share. On any given day there are several substitute teachers filling in. There is a substantial administrative department. The cafeteria has its own staff. The maintenance team is at the facility early in the morning and late at night. Schools also have a security team making sure the students are safe. Districts use contractors to substitute for teachers who are sick or on vacation. Many K-12 schools also have volunteers who must be scheduled. These include coaches, tutors, field trip chaperones, library workers, and playground supervisors. Students fill some of the aide roles and may need their hours recorded if they are earning credits. Some employees work at more than one school in a district. Many districts can’t afford onsite nurses, speech therapists, and IT personnel at every campus. Each job role has its own schedule. Not only the daily hours worked, but seasonal schedule variations as well. Teachers in K-12 schools generally work 7.5 hours per day. Some administrators work 7:00-3:00 but there are many part-timers. The cafeteria staff includes full-time and part-time workers. Many schools offer breakfast in addition to lunch. A school cafeteria operates like a restaurant with the associated scheduling challenges. Maintenance workers have variable schedules. Maintenance must also schedule for after-hours activities. There are athletics, dances, plays, and music performances. Many schools have security personnel onsite during school hours. Other institutions have part-time security staff as needed. Some districts are expanding their security departments in the wake of recent shootings. What is the Best Staff Scheduling Software for Education? TimeSimplicity is a cloud-hosted scheduling system from SwipeClock. 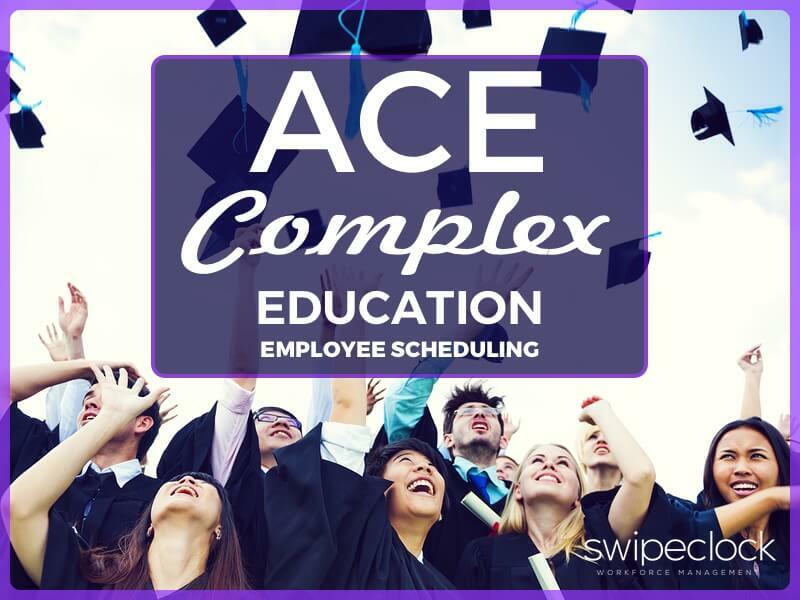 TimeSimplicity staff scheduling software can handle the logistics of education staff scheduling. It has a convenient user interface that requires no training. It is affordable for even the smallest schools (or smallest budgets). How does TimeSimplicity streamline staff scheduling? Education staff templates help you get started. You can also create your own templates and copy forward. Drag and drop easier than spreadsheets. Each department head can create a team schedule for any time frame. The principal or administrative head can monitor all the department schedules in one view or separate. TimeSimplicity provides a graphical view of labor activities in every school department. View schedules by department, employee type, week, or month. Online job board for subs shows open slots immediately. The online substitute hub is bi-directional. The substitutes can define their availability from week to week. When they see openings, they can request the shift. School administrators can view all available subs and make requests. The substitute shift hub can be set up for the entire district or any group of locations. TimeSimplicity staff scheduling software handles all the employee classifications needed at a K-12 institution. Full-time, year-round, part-time, substitute, and student teachers. Plus seasonal employees, independent contractors, volunteers, and student aides. TimeSimplicity provides a graphical view of labor activities in every school department. Here is another area where school staffs cover the spectrum. TimeSimplicity scheduling software simplifies vacation, sick time, holidays. You can set PTO rules for every employee type. Schools need a qualified teacher in every classroom. Every single day, no exceptions. TimeSimplicity staff scheduling software has tools to handle both planned and unplanned absences. TimeSimplicity sends the administrator(s) email and SMS warnings if a class needs a sub. The opening posts on the substitute schedule board. When a substitute accepts a job, the system immediately notifies the administrator. TimeWorksPlus is the time and attendance system from SwipeClock. For complete employee scheduling and time tracking, use TimeSimplicity with TimeWorksPlus. That way, you get the full benefits of each system. With TimeWorksPlus, you import the employee hours data directly into your payroll system. It requires no manual data entry. Schools that upgrade from manual systems reduce the time it takes to run payroll. This reduces a burden for the HR team. They are able to handle other projects that benefit the students. Employee salaries and benefits comprise 80 percent of district operating budgets. Education budgets are tight around the country. This will probably never change. Regardless of budget size, districts can save money on labor without shortchanging students. They need an automated system that takes the guesswork out of employee scheduling. TimeWorksPlus automates employee time tracking so schools can optimize their workforce. This ensures that public school students get the most value from taxpayer dollars. And private school students get the most value from their parent’s dollars. TimeWorksPlus works with any physical time clock. Employees can also clock in on a web portal. Schools can use a different clock in method for each department or employee type. There are mobile apps for substitute teachers and employees who work at more than one school. Define employees as salary, hourly, or contractor. Track multiple pay frequencies. There are tools for seasonal pay structures. Classify work-study hours and grant-tracking. Some employees fill more than one role—say history teacher and volleyball coach. TimeSimplicity can handle multiple pay codes for these versatile employees. Union contracts can also pose a challenge for school workforce management systems. TimeWorksPlus easily handles the most complex union pay structures. The system lets you distinguish between union and non-union employees. How Does School Staff Scheduling Affect Students? Many districts overlook the importance of effective staff scheduling. Innovative scheduling results in a better experience for students. It supports the work/life balance for teachers and other school employees. This improves the classroom environment for everyone. Schools that schedule well can attract and retain qualified employees. Schools need easy-to-use automated scheduling software to capably handle the logistics of school staff scheduling. SwipeClock has workforce management tools for educational institutions and other non-profit organizations. See SwipeClock for Education for more information about school staff scheduling.